Please Support My First Kickstarter Project! I hope you all had a great Christmas yesterday and are continuing on with the festive holidays. I haven’t been busy because I’ve been absolutely swamped the past couple of weeks – I cannot remember having been this busy during a 2-week period for many many years. That being said, I’m back and have a bit of a favour to ask. As the title of this post already reveals, I created a Kickstarter campaign for Votesy and am currently seeking backers. There are 9 Reward Packages to choose from, ranging from $5 to $500. If you are new to Kickstarter, you should know that you are only billed if the project meets its goal. As I write this post, there have been 4 backers so far, having raised $370 CAD of the $68,000 goal. There are only 17 days left in this campaign! I had initially set the campaign at 30 days as I had read that that timeframe had the best results. However, due to being so busy lately and with the holiday season, days have been passing by quickly before I’ve been able to spread the word properly, which is why I’m doing it now. 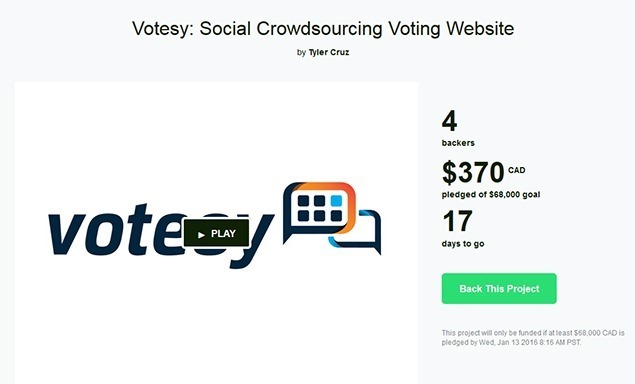 If you cannot afford (or have no interest in) becoming a backer for this campaign, then perhaps you could still help me out by sharing the Kickstarter link (https://www.kickstarter.com/projects/tylercruz/votesy-social-crowdsourcing-voting-website) on your social media channels or even blog if you have one? This has got to be a joke. Why would anyone just give you money for nothing of value in return? He is giving something in return. He’s giving away t-shirts that his friend sent him as a gift! Tyler you’re being completely unrealistic here if you are expecting us to pay all your start up costs for a commercial business, and you retain all ownership and profits. You’re not exactly working on a project thats for the public good or is going to make me be happy to be funding are you? Put it on CrowdCube or any of the other platforms that actually give people something in return for it. As a free t-shirt that you got from someone else is just not going to cut it. I can’t follow this blog anymore. He has officially lost it. I wonder how the investor feels at this point and wonder if he would have invested in the first place knowing a kickstarter would be created for your second round of funding. To ask people to raise 50k for something YOU should fund yourself speaks volumes as to how much you actually believe in the success of it (not even counting having the first investor on board). I was suspicious at first of why you wanted to bring in any investors but now doing this kickstarter….it says you’re either broke or have little faith in turning a profit ever. I can’t understand the logic here. The public has already spoken as to what we think on the viability of the project. We were given the chance to actually invest in it; we declined. I’m honestly curious how someone can go from failing at asking people to invest in the project, to then asking people to give you the money for free. To me, the Kickstarter has zero chance of success and it came at the cost of Tylers dwindling credibility. I’d be interested to know why this was really done, as with Kickstarter you don’t get the money unless its fully funded. Was it just to push a little more publicity to it? I would say that would be counter productive, as you’re doing it in a way that exposes the business was a failure before it even launched. I think its back to the drawing board with this one… cut your losses and bin this domain before you waste any more money? Or is the game just a hail mary play with someone else’s cash so little personal risk? “Fund my startup at kickstarter for no good reason other than I kind of ran out of cash, oops”. I’ve been following your blog posts, but this project is heading straight to failure. I don’t know where you see the potential in this project at all. I really want to support you, is there an option to donate $2,000? Can I do that with my Debit card? I don’t have credit card. Please let me know. Really? Don’t you own two houses? You make it sound as though you are going to be destitute if this doesn’t work out..
What is the ROI for investors? There is no ROI for investors, if you could call them that. “Gifters” may be a better phrase. If you look at other well run Kickstarters, the person paying the money would often get access to the product in question, either quicker than everyone else, at a discount and/or a special version. For example https://www.kickstarter.com/projects/gotham/invincible-end-bike-theft-once-and-for-all?ref=recommended is a good one… if you want to do support the project you can do so by “buying” the item. In some convoluted way Tyler was probably expecting to get some publicity out of this. The contrary is true however, this does nothing else but reflect badly on him and this project. How can you expect people to donate money to you for a commercial venture with getting nothing in return and on top of that: how can you be morally okay with this when they do? Also as an initial investor this would strike me as really worrysome. It would appear to me you lost faith in the project yourself as you wouldn’t want to carry the financial risk yourself beyond this point. After over a week, 4 backers with a total of $268. Tyler, I’ve read your blog on and off over the years. This is RobotWarz all over, except on a much grander and more expensive scale. How much did he sink into RobotWarz again in total? Yall are kinda being cruel at this point. People up here bring 100% valid points. You can’t expect people to ‘invest’ in your project and get nothing in return. On top of that, even if they were foolish enough to do so, I can’t believe you would be morally okay with that. If I were an investor of you, I would’ve lost all faith after reading this post. A big $1,500 from that sale. You are ON FIRE! What were the investors for?? He f*d up his budget calculations. He raised a bit of money, and hired expensive contractors by the hour. The project ended up taking longer than expected, feature creep, etc. Now that the project is in “prototype” stages, him and his investor realized it’s not that useful and nobody is going to want to use it. To solve that, they need to add more features of course! But neither him or his investor have much confidence in the product now that they’ve had a chance to play with it – so of course, let’s spend other peoples money! I follow Tyler on Twitter. He made an announcement last night that his site went live. I checked it out. 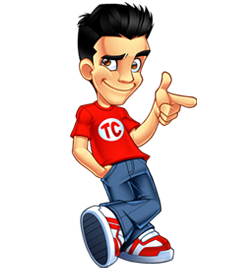 I found a couple of bugs that I let him know about but the site looks very clean and functional. Just checked it out and it looks terrible. No idea who the target audience is… is this suppose to be a “fun” product? Why does the site go on and on about “anayltics”… And what is this loader animation on every page load? I hope he proves us all wrong but this project looks like a bust and I think it should have been canned long ago. Its painful to watch, but like a car crash across the road its hard to look away. Wow – this site is so useless. What’s the point? How long until this site is gathering dust and Tyler has moved on to another project? Too bad you exhausted your life savings – except, of course, for the two houses you own and the money you are about to invest in the markets. Tyler, are you monitoring this post? I’m sorry to see so much negativity here but there’s certainly enough feedback to suggest you think more about this before you continue. My 1st though is … who on earth is going to understand what “Votesy is a free social crowdsourcing voting platform and community” means? With so much of negativity, I hope you tackle well with all the negativity over here and take all the possible feedback and suggestions that will help you improve your plans to drive you to success. I think what happens to most us is that our interest changes over time. We initially start out in one direction and over time we drift in a new direction, whether intentional or not. I’ve been keeping up with Tyler for a while now and it seems he is moving in a new direction — maybe real estate investment. I know the biggest killer for me is time. There simply is not a lot of time to keep for me to keep up promoting and maintaining a lot of websites. It makes sense sometimes to just offload it so that you can maintain focus and commit to your desired interest.